Place 2 slices of bread on a cookie sheet. 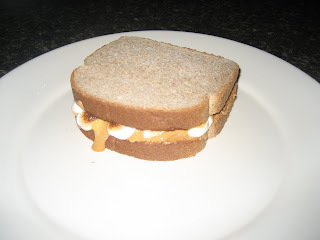 Spread peanut butter over 1 side of each of the slices. Sprinkle marshmallows over the top of 1 side (the more the better). I also sprinkle a few on the other slice too and eat those while they are warm :). Place cookie sheet under the broiler until the marshmallows look nice and toasted and the peanut butter is all melty. Then put the two slices together and enjoy!! This goes really great with Chocolate Milk!! OMG!!! I was perusing your blog and stumbled upon this so I decided to try it...SOOO yummy!! I have one bite left of mine and if Hunter doesn't hurry, I'm eating his too! !